I was thinking we always had some kind of tournament or Outing Challenge during the December holiday seasons so I thought I'd get something going so we can all enjoy and participate in some friendly competition during the festive season. 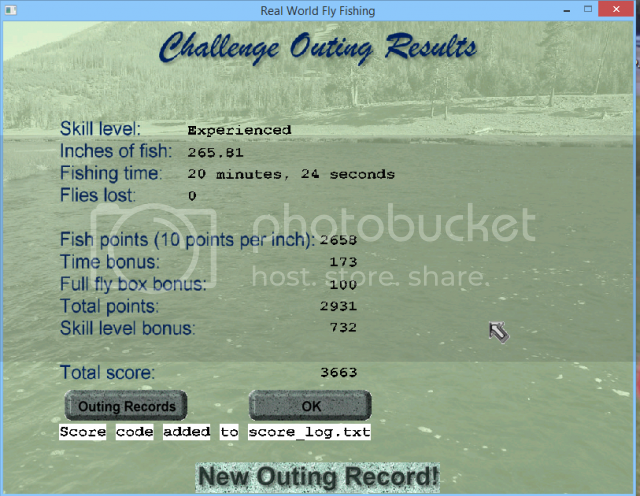 Tonight I fished the new McKenzie River in Challenge Mode and here you will see the first results. I fished in Experienced Mode, using 9ft rod, 8w line and 2X leader. I thought this tackle choice was light enough to allow the fish to fight as they should, but still strong enough to land most of them. Here you will see my first score using the designated tackle. As you can see some of the fish are pretty large for this outing but the time was not great. I had a little trouble in a couple of the scenes and had to cast to different places before I finally got a hook up. I am sure most of you can come up with a better score if you give it a try. So guys, let's see what you have got! Question: Do they folks have the McKenzie River Outing revisited that you've updated for me? 2nd Question: Where do I find those challenge codes in the game so I can post them like you have? as long as we you the same equipment you used? There are three different versions of the McKenzie River. The first one was the old classic that Cutch created several years ago. The second version is called "Cutch Lower McKenzie Revisited". This outing was made based on Cutch's original outing but with updated jumping fish species.This version has not yet been published. The third version is called "C L McKenzie River, Oregon". This is the version that I did using some of Cutch's original pictures, and redid it in the 6 frame per cycle format with some picture enhancements and some new fish species. This is also the version that I just published and I did my outing Challenge on this one. Hopefully sometime in the near future I will finish up the "Cutch Lower McKenzie Revisited" and will upload it on the Forum for all to enjoy. Cutch's second question: You can use any flies that you want (dries, wets, streamers, etc) but the tackle and leader size should be the same as those I used in the Challenge and also using Experienced Mode. This will ensure that all the scores turned in are based on the same tackle used. You can find the score codes by going into your main RWFF Folder and clicking on "score_log.txt". Just copy and paste the lines pertaining to the last Challenge that you did, e.g. 9 score lines for the fish (as there are nine scenes in this challenge) , and 1 for the final challenge score and copy and paste those into your RWFF post. Roger will verify those score lines and make sure that everybody is using the same tackle and leader size, and also done in Experienced Mode. 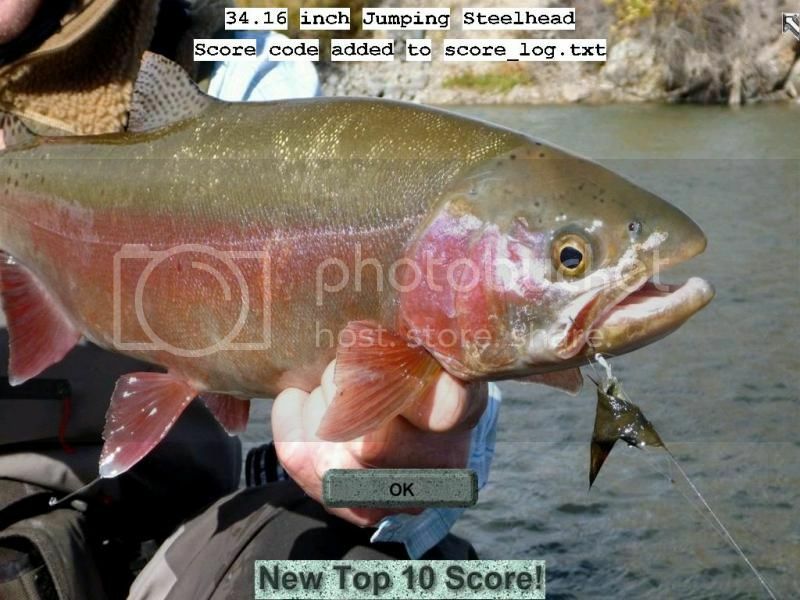 I think you will all enjoy fishing this outing Challenge as the action can be pretty fast and furious in many of the scenes, however, there will also be scenes where you will need to look for the fish to have success. Keep those scores coming in! Good luck everyone! First, thanks Badger for posting a great score. However, you challenge was done in "Expert Mode" and not in "Experienced Mode" so Soreeee! As old Barns would say, and it will not count. We decided a while back to run the all the Challenges in Experienced Mode as it makes life a lot easier for everyone who wanted to participate. Cutch, glad you finally found the McKenzie River file. Please give the Challenge a try and I think you will really enjoy fishing it. Would love to see any score that you come up with here. 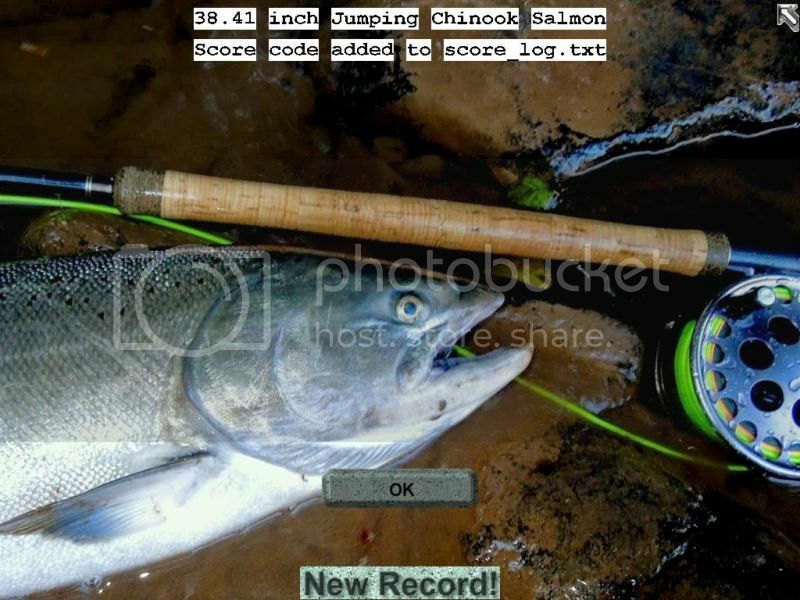 Just don't spend too much time admiring the beautiful McKenzie River country side as you want to land the fish as quickly as you can to earn time bonus points. I am hoping that Chuck, or maybe even Barns will come back and do the Challenge again. They have been "away" for a while now. Here's my first try at this beautiful remake of the Mckenzie River. Excellent job Stanley and beautiful caught photos. Thanks. I tried the McKenzie River Challenge again tonight. Guess what? like they say I was first time lucky. Although I thought I had caught some good fish in a shorter time but my score was not better than my first attempt. It was still a lot of fun and I must thank Cutch for suggesting the remake of this beautiful river and the new fish species. Here are some scores and fish pictures. 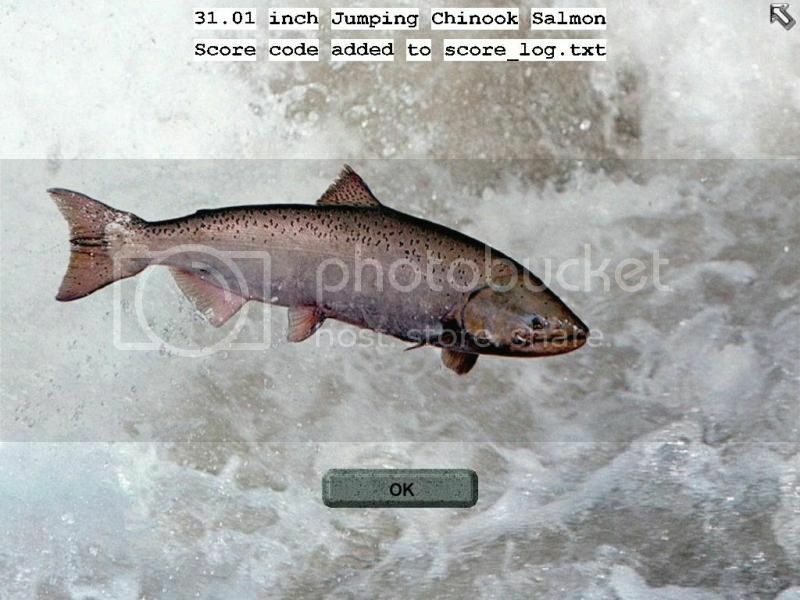 A great picture of the Jumping Chinook Salmon! This is something interesting for you guys. Knowing that I love fishing and fishing simulators, my son Tim gave me a Christmas present in the form of a brand new fishing simulator by Dovetail Games. He is fan of "Steam" online games and he found this new beta version on the Steam website. To begin with, it was a huge download when compared to our beloved RWFF software. Took me almost an hour to get through the hassle of signing up with Steam and to download the game. As I said this was a beta version and is still in development stage. You want my opinion on this? 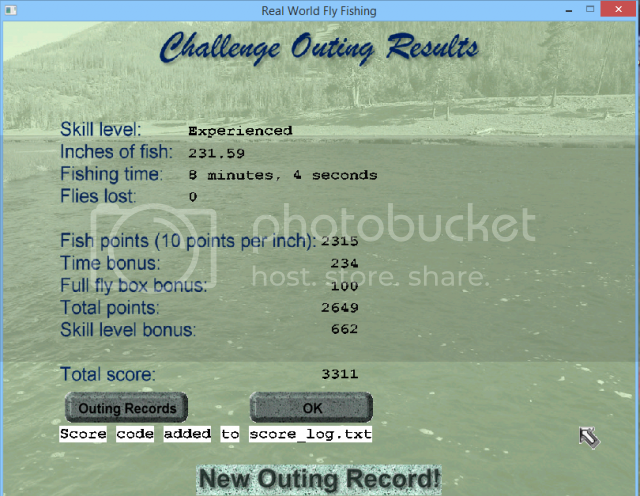 Like Cutch, I have tried a lot of fishing simulators before I finally settled on RWFF. With Paul always capable and instantaneous help it makes everything even a little better! Well here's my second try at this challenge. Stanley, beautiful job with this outing remake, beautiful scenery and on a few of the sites, I believe my score would have gone a lot higher but 2 of your huge jumpers decided to just keep jumping and after a few minutes on each one they threw the hook, no problems with lost flies they just liked to jump and spit the fly back at you. You have some tricky currents and had to have a few perfect drifts through the same area to get hook ups. Outing was excellently done all the way around. Enjoyed it completely, job well done. Wow! That is a fantastic score that you turned in there, Roger. Congratulations. This will give Badger some hard work to do. Knowing Badger he will be trying his best to beat your score. This is what friendly competition is all about and you guys have lots of heart! Thanks for liking the remade McKenzie River outing. This was a great suggestion by Cutch, one of our old Masters. Without his input and great pictures this outing would not have been possible. Thanks Cutch! Tonight I decided to fire up my Windows7 laptop and tried doing the McKenzie River Challenge on it. I keep the laptop as a spare computer so when the main desktop goes bad I would have something to fall back on. The screen is much smaller than my regular desktop monitor but the scenes looked better as the colors and resolution are very good. Besides, you wouldn't have to move your mouse too far to get from one side to another. I had a few minutes of very entertaining fish and came up with a decent score. Not quite as good as Roger's but it is still pretty nice. 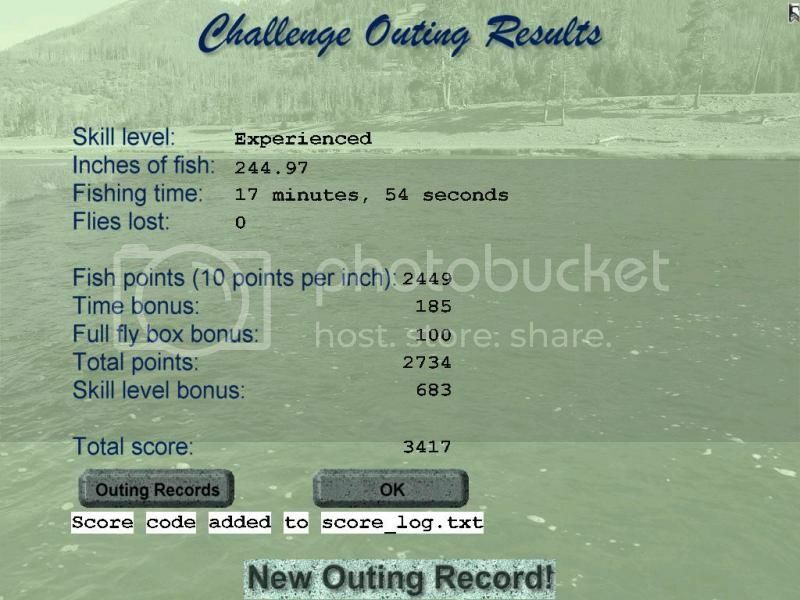 The is my latest effort done on my laptop with a score of 3585. I did have the hook come off in one of the big fish in one of the scenes. Otherwise the score might have been slightly better. Com'on guys, don't just sit on the sideline and watch the competition. Download the Challenge and give it a go and see what you can come up with.